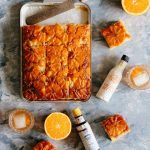 This Bourbon Old Fashioned Upside Down Cake with Winter Oranges is a moist vanilla buttermilk cake that’s drenched in a hot orange and bourbon butter sauce, making it taste like an Old Fashioned. 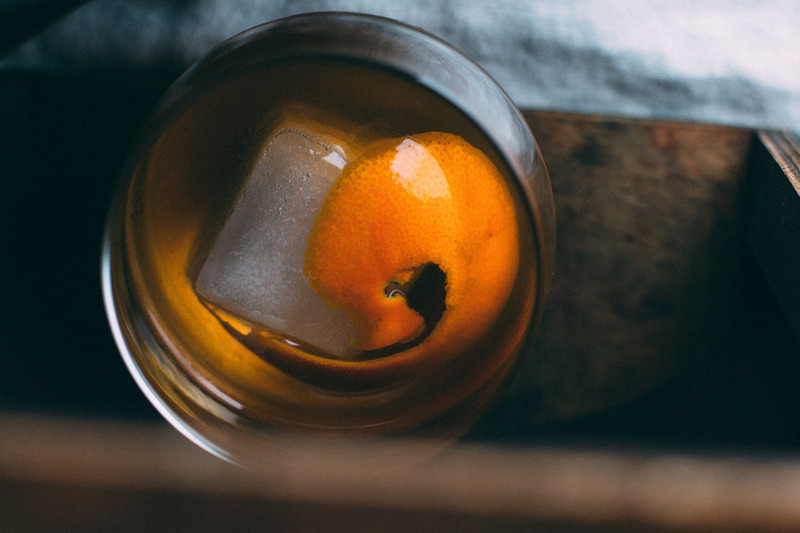 Eating it while sipping on an Old Fashioned is one of life’s true blissful moments. I’ve not been too fond of sugar lately and really enjoyed my January refined sugar-free month. I allowed myself to use honey, maple syrup, and in some cases, coconut sugar but I tried to not rely on sweeteners in general. But baking ideas get stuck in my head a lot and refuse to rest until explored. 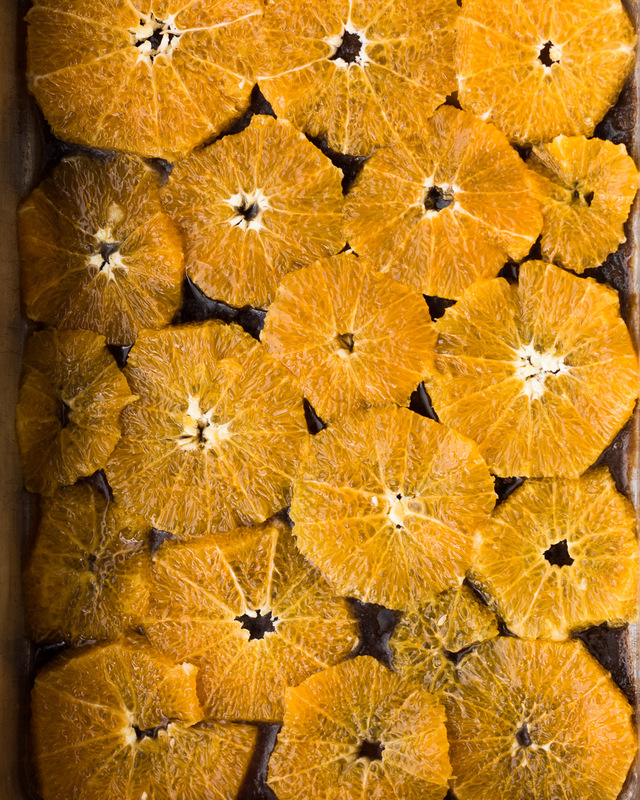 And then there’re food holidays like Valentine’s Day and seasonal produce like oranges. Which is why, despite me not wanting to eat sweets, I went on a baking spree that included an Orange Chess Pie, a Horchata Latte Cheesecake, and this Bourbon Old Fashioned Upside Down Cake. 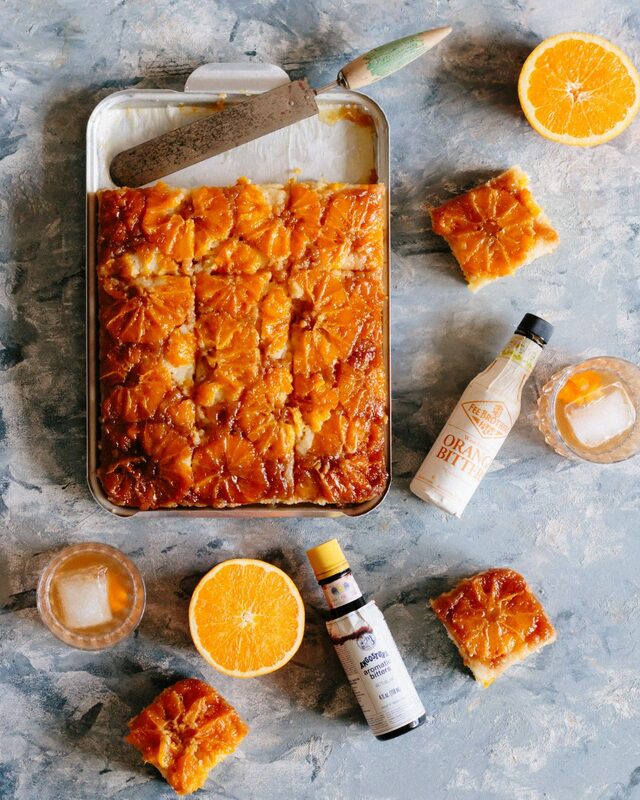 The Bourbon Old Fashioned Upside Down Cake got a lot of responses on my Instagram stories so I’m saving the Orange Chess Pie for a rainy day. I always had a Kentucky Butter Cake at my Grandma’s. It’s usually baked in an angel food cake tube pan or a bundt pan. Apparently, it’s a recipe that was created by Nell Lewis for a Pillsbury Bake-Off Contest in Platte City, Missouri in 1963. And it won. Because it’s the best. 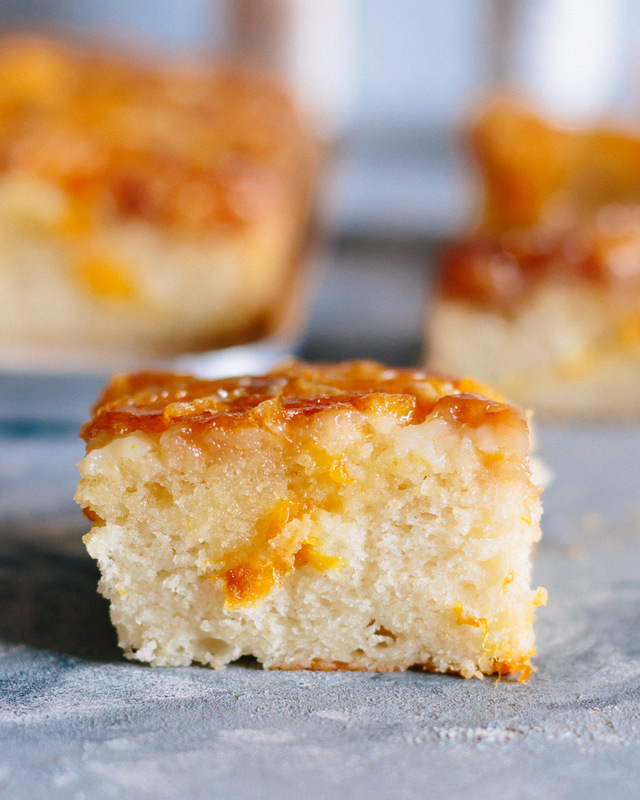 Even before you pour the hot butter sauce over it, the cake is moist and flavorful. But once you add that sauce, it’s game over. You might as well accept you’re going to have at least two slices. 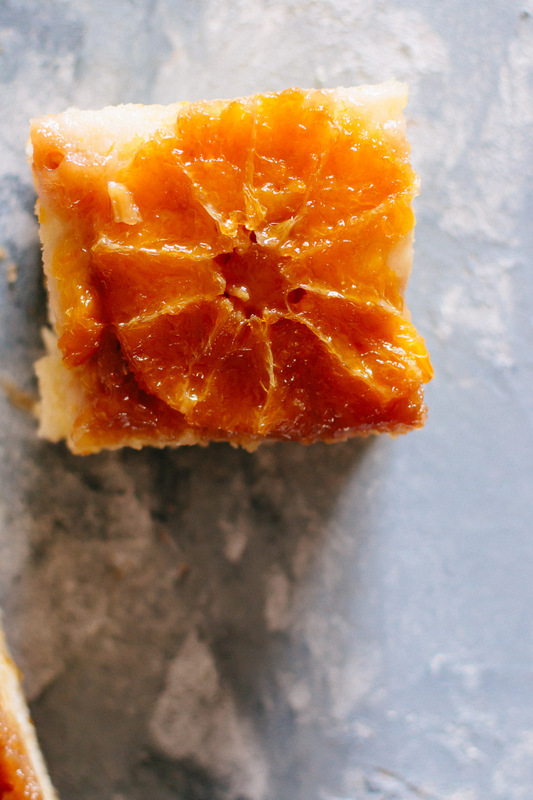 When my orange tree kept producing buckets of oranges, the Kentucky Butter Cake is what popped into my mind as being the perfect cake for baking an orange upside down cake. 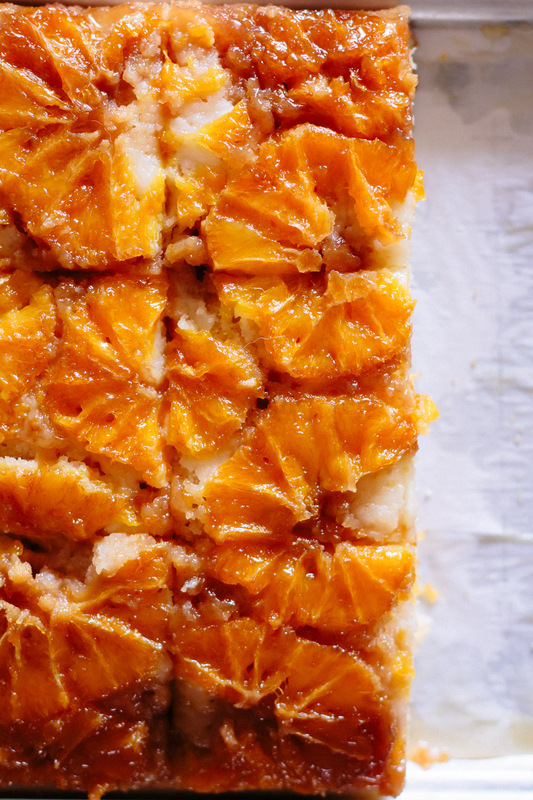 Kentucky Butter Cake was always served with a hot butter sauce in our home. We would poke holes in the hot cake and drizzle the sauce all over it. 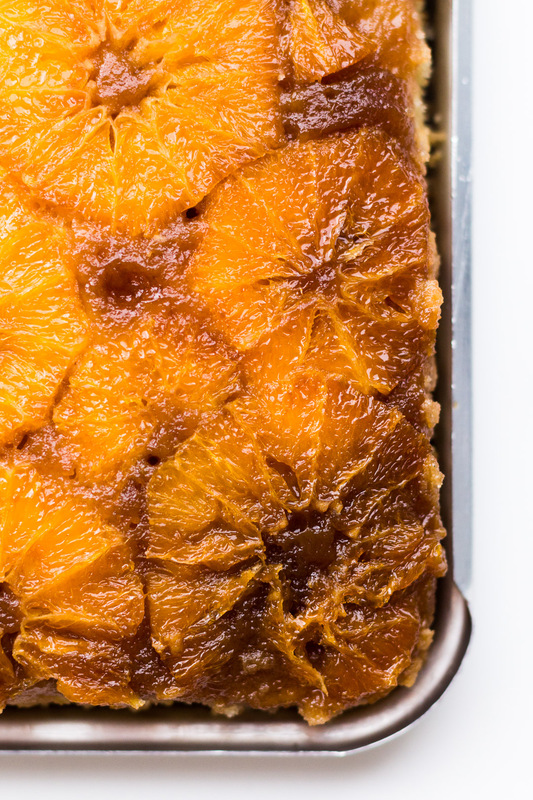 Which makes this cake an upside-down cake AND a poke cake. And that’s a win in my book. 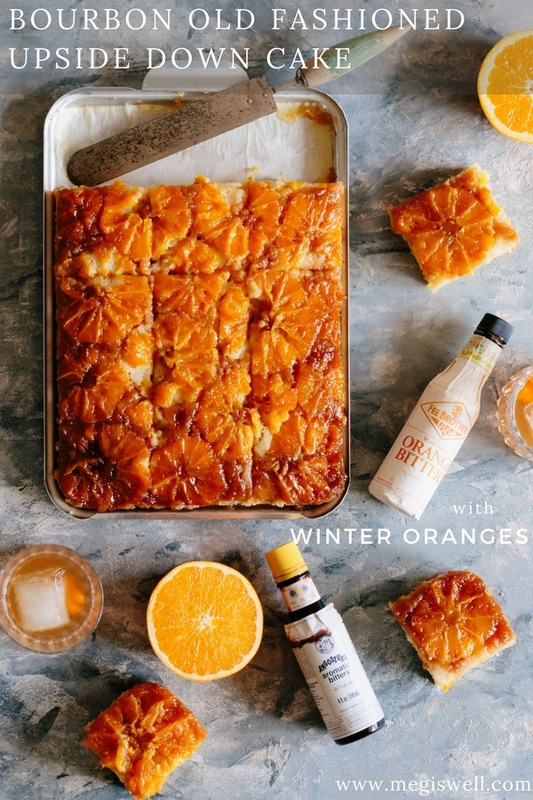 It’s the sauce that got me thinking of making this an Old Fashioned themed upside down cake. 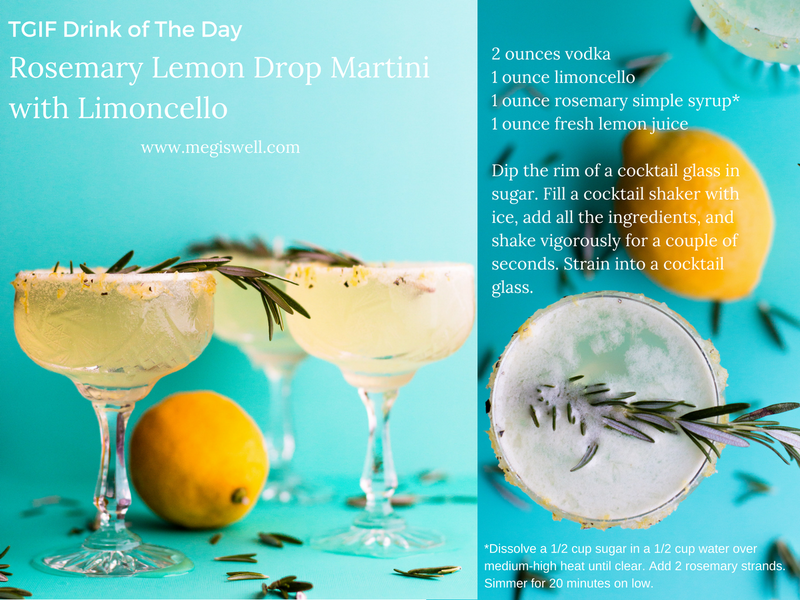 I replaced the water in the sauce with a 50/50 mix of fresh squeezed orange juice and bourbon. Once the butter is completely melted and the sugar dissolved, a couple dashes of orange bitters and Angostura Bitters really make it into an Old Fashioned Hot Butter Sauce. Don’t worry, the cake is really easy to make. But starting a part-time job and trying to blog at the same time is harder than I thought it would be. Which is always how life goes. I work Monday 8 to 3 and Tuesday, Thursday, and Friday 11 to 6. There’s been some overtime work as well and a lot of things I planned on getting done aren’t done yet. I’m seriously learning SO MUCH. Sometimes I feel like my brain will explode but I love it. Every week I’ll probably get a little better at fitting in blogging more regularly. 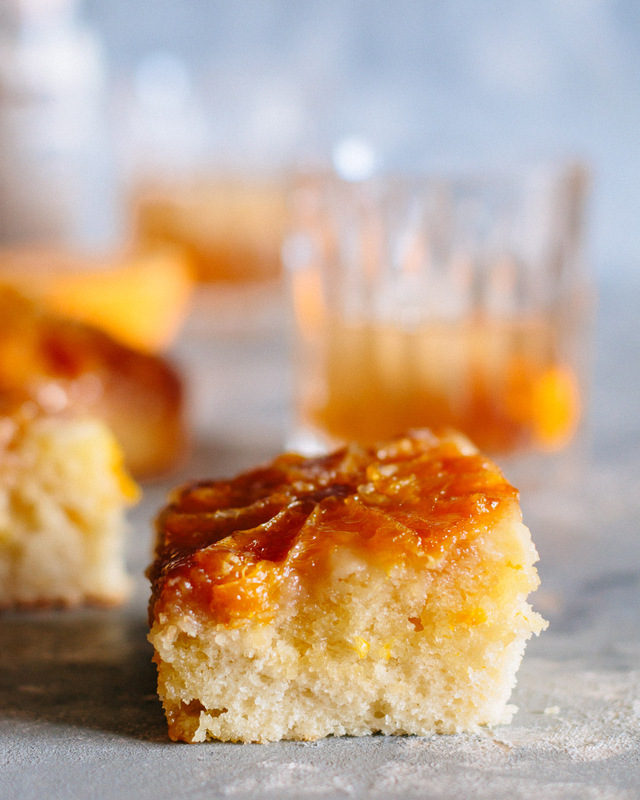 In the meantime, just enjoy this Bourbon Old Fashioned Upside Down Cake. And a strong Old Fashioned. 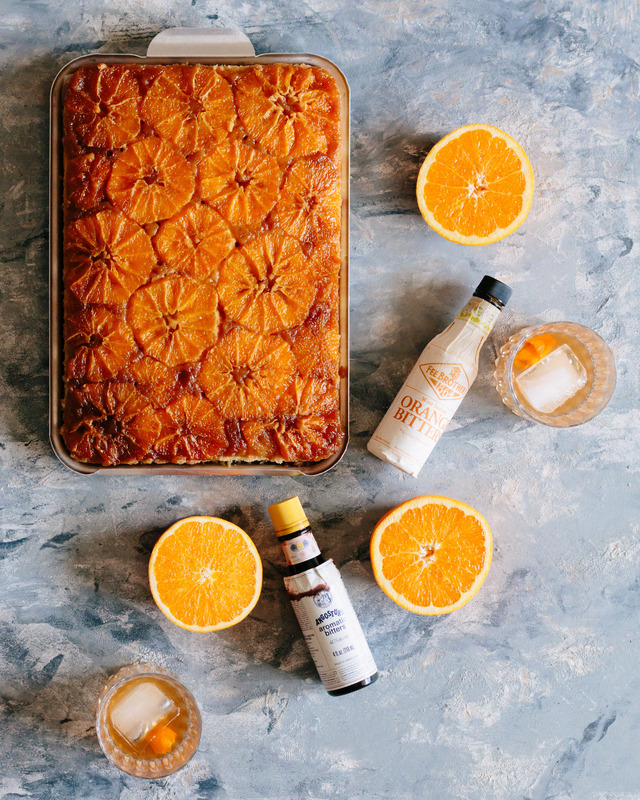 This Bourbon Old Fashioned Upside Down Cake with Winter Oranges is a moist vanilla buttermilk cake that’s drenched in a hot orange and bourbon butter sauce that tastes like an Old Fashioned. Preheat the oven to 350 degrees Fahrenheit. Grease a 9x13 inch baking pan. Melt the butter and pour it into the pan, spreading it out evenly across the surface. Sprinkle the brown sugar over the melted butter and pat it down. Drizzle the bourbon onto the brown sugar and tilt the pan to spread it around. Pat down and redistribute the brown sugar evenly if it moved. 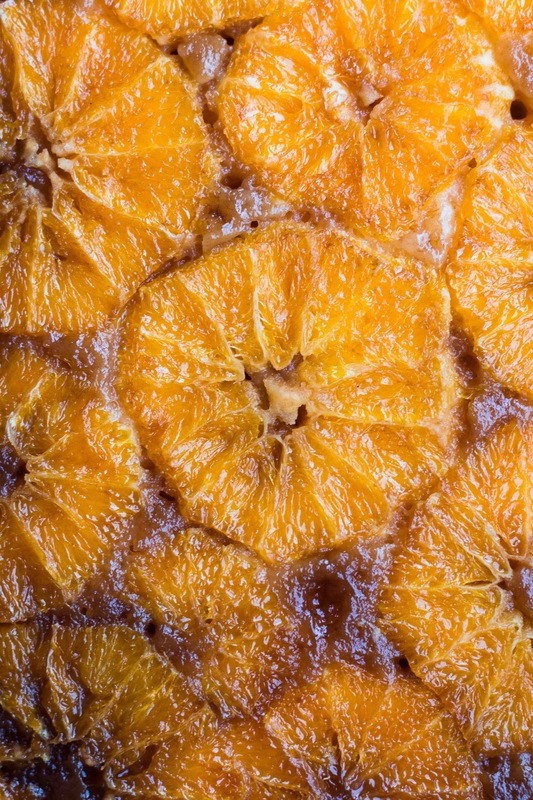 Lay the orange slices evenly across the surface and set aside. Sift together the flour, baking powder, baking soda, and salt into a medium bowl. Add the eggs one at a time until just combined. Mix the vanilla extract in. Alternate adding the buttermilk and the flour mixture until everything is combined. 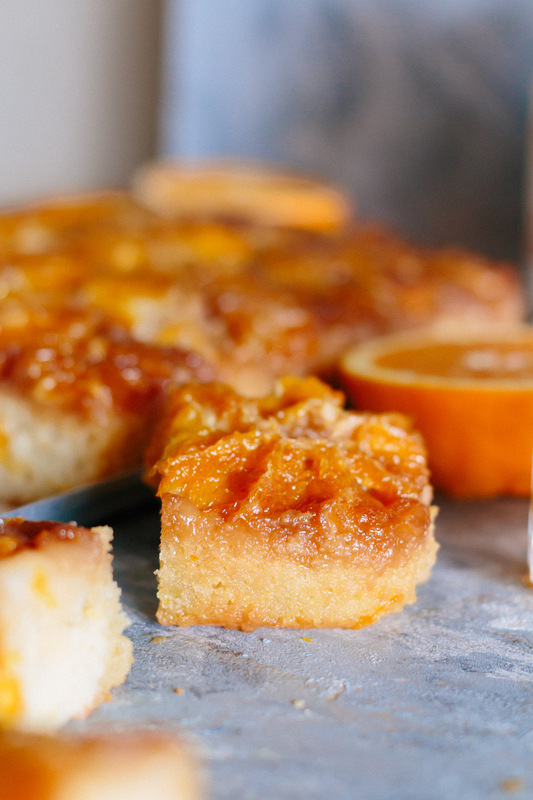 Pour and scoop the batter over the orange slices and spread evenly. Bake for 50 to 55 minutes or until the cake is done and a toothpick inserted in the center comes out clean. Run a knife around the sides of the pan. Place a heatproof serving plate upside down onto the pan and turn the plate and pan over. Leave alone for 5 minutes and then remove the pan. Make the Old Fashioned Hot Butter Sauce while waiting. Use a fork to poke holes in the cake. Don't worry about ruining how the cake looks, you don't notice the holes. Pour the Old Fashioned Hot Butter Sauce over the cake and serve. Combine the butter, sugar, bourbon, freshly squeezed orange juice, and orange zest in a small saucepan. Cook on medium heat until the butter is melted and the sugar is completely dissolved. Add a couple of dashes of the orange bitters and Angostura Bitters. Pour over the cake. Before peeling the oranges, make sure you zest one to get a 1/2 teaspoon orange zest for the Old Fashioned Hot Butter Sauce. Get 6 oranges for the whole recipe to be on the safe side. 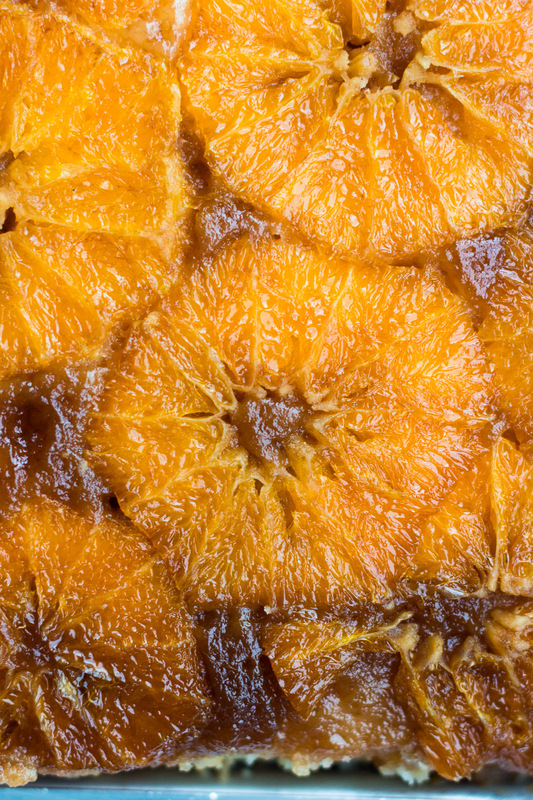 The size of the oranges and how many slices you can get from each will determine how many oranges you will need. The oranges from my tree are big but they're navel oranges, and the little baby orange inside makes it hard to get very many slices. Also, consider that you need 1/4 cup freshly squeezed orange juice. I got that much juice from half an orange. I think it is JUST WRONG that I’ve never had a KY Butter Cake OR this cake! I need to fix that ASAP- and I hope your new job is going well!!! Haha right?! And it’s going really well, I feel extremely lucky that I landed the job because it’s so perfect for me!